Middlesbrough v Wigan Athletic: What time is kick-off, is it on TV and what are the odds? Middlesbrough host Wigan Athletic on November 10 hoping to keep within touching distance of the Championship top two. Whilst remaining hard to beat, Boro's form has stuttered of late with three consecutive draws, however remain just two points off the automatic promotion places. 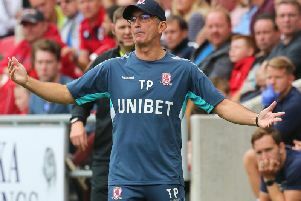 It is seen as a good opportunity for Tony Pulis' side to get back to winnings ways with the Latics holding the third worst away record in the division. And if results were to go their way on Saturday evening, Middlesbrough could find themselves back on top of the table with 17 matches down. Kick-off is at 3pm on Saturday, November 10, 2018 at the Riverside Stadium. The game will not be shown on BT Sports or Sky Sports, however you visit the Hartlepool Mail website for post-match reaction. How can I follow the Middlesbrough v Wigan live? You’ll be able to follow all the latest updates and team news via the Middlesbrough section on the Hartlepool Mail website. The man in the middle will be Darren England - his assistants are Nick Greenhalgh and James Mainwaring while the fourth official is Tom Nield. Jordan Hugill could be chosen to lead Boro's attacking line for the second consecutive game after Britt Assombalonga was dropped to the bench for the 0-0 draw at Stoke City last time out. Pulis has reverted away from his 3-5-2 formation, switching back to a midfield three of Mohammed Besic, Adam Clayton and Jonny Howson with Martin Braithwaite and Stewart Downing either side. Dael Fry featured at right-back at the weekend with Danny Batth and Aden Flint preferred in the heart of defence. Wigan right-back Reece James scored his first competitive goal in Sunday's 2-1 home defeat league leaders Leeds United. It will be a trip back up to the North East for centre-back Dan Burn, who began his career at Darlington and striker James Vaughan, who played for Wear Tees rivals Sunderland. With Will Grigg set to remain sidelined, Joe Garner is likely to take his place. What is the form of Middlesbrough and Wigan? Middlesbrough are the favourites, priced at 9/2 to win while 13/5 says the two sides will draw. Wigan are a 9/2 shot to secure only their second away win of the season.